For Halloween, I decided to make a little treat for trick or treaters stopping by. 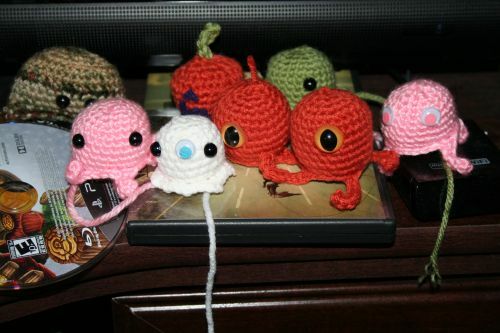 These little monsters are done in the round -increasing until 24 stitches starting with six in a magic ring. A few even rounds and then I started the decrease. The first decrease round I did in the back loops so that leaves the front loops available. I used the front loops for the legs or tentacles – use the imagination. Some monsters have one eye, two eyes, or even three eyes. These are the ones claimed by my daughter and she even claimed one Halloween night. 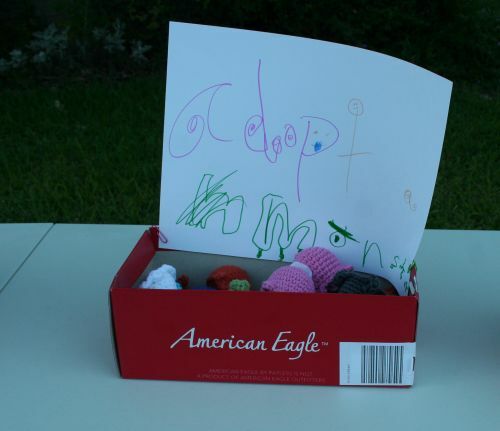 We set up the monsters in a shoebox with an adopt me sign that my daughter made. The kids seemed to like them. One neighbor said I won at Halloween – so I will take that as a compliment! I wished I had started these sooner as I would have done more detail. But there is always next year. This will be a fun, ongoing project that will help to use some of my yarn stash.